Big changes are on the horizon for men's and women's basketball teams in the National Association of Intercollegiate Athletics. First, the NAIA will consolidate its two divisions into one for the 2020-2021 season after member schools voted in April to make the change. Division I schools now can offer up to 11 scholarships to players who actually get playing time. Division II schools can currently offer up to six scholarships. When the merger of the divisions takes place, schools would be able offer up to eight scholarships. Culver-Stockton College and Hannibal-LaGrange University play in Division I, which had 94 teams last season. Division II had 135 teams last season. The NAIA handles scholarships differently than NCAA schools. Players on NCAA teams who receive scholarships must be counted toward the school's limit, whether they play or not. Players on NAIA teams who receive scholarships are only counted if they play. Culver-Stockton, for example, had 38 men's basketball players and 29 women's basketball players for the 2016-17 season. Obviously, not all of them played, but Athletic Director Pat Atwell said most of them are receiving some sort of athletic scholarship that could range from $1,000 or $2,000 to as much as a full tuition grant of $24,990. C-SC's men's team was credited with using 6.57 scholarships or "equivalencies" for the 2016-17 season, and five teams in the 13-team Heart of America Athletic Conference used more than eight. C-SC's women used just 3.54 equivalencies, and only two Heart teams used more than eight. Jason Nichols, athletic director at Hannibal-LaGrange, said his school typically uses "between 3.5 and 4.5 equivalencies." He said some of the schools in the 13-team American Midwest Conference give less, but he believes the number of teams that give eight or more equivalencies "is comparable to the Heart." Schools can keep the number of equivalencies low by claiming exemptions for good grades. A full exemption is given to a student with a grade-point average higher than 3.6, and a half exemption is given to a student with a grade-point average higher than 3.3. C-SC's women had 9.5 exemptions last season, while the men had 4.5. Atwell says trimming three exemptions for the 2020-21 season won't have much of an impact at C-SC. "The smaller (Division II) schools might not embrace the full enrollment aspect, because they believe they can't afford to give that many scholarships," he said. "To us, it's OK to do that. We voted for it. We had no issue with it whatsoever. We have a discount rate for every student, and the income is still there for the college. It's just schematics for us. "Some of the smaller schools are worried. Time will tell." Nichols says the change might help balance out the haves and have nots in the AMC. "It doesn't affect us much now, but it could eventually," he said. "Our competition can offer three less scholarships. There's always going to be ones who have more than others, but resources are never completely equal. We could complain about it, but this is what we have, and we'll do the best with it." 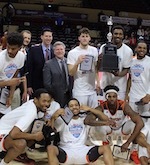 The merger also affects the crown jewel of the NAIA's postseason offerings -- the 32-team Division I men's tournament. The first NAIA bracket had just eight teams in 1937, and a year later, it went to 32 teams. It has since remained that way. The past 54 tournaments have been played at Municipal Auditorium in Kansas City. The Division II men's tournament, as well as both women's tournaments, also have 32 teams. 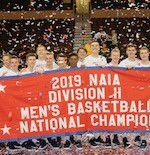 In 2020-21, however, 64 teams will qualify for the NAIA men's and women's tournaments. The new format will have 16 regional sites of four teams each. Those games will be played on a campus or a neutral setting, the sites awarded by bid. Sixteen winners will advance to the finals sites. The changes are the result of a multi-year study. "A higher percentage of teams were qualifying for the national tournament in basketball than any other sports," Atwell said. "In Division I, you had a one in three shot of going to this marathon (six-day) tournament. They're trying to spread the wealth a little more." Twenty-one conferences are afffiliated with the NAIA. Atwell guesses that each conference will get two bids to the 64-team field, with the rest filled by at-large teams. Culver-Stockton has qualified for the NAIA men's national tournament seven times, with its most recent appearances in 2013 and 2014. Quincy College participated nine times, finishing third in 1977-78. Hannibal-LaGrange qualified in 1998. No C-SC or QC team has played in the NAIA women's national tournament. HLGU qualified three times. " (The changes do) lessen the chances to make the national tournament a little more," Atwell said. "But if we're good enough, we'll make it."